Hochevar’s season took another turn on Wednesday, as he turned in his best start since throwing 7.2 shutout innings including 15 ground balls in his opening day start against the Detroit Tigers. Hochevar went the distance, striking out seven, walking two, and allowing one home run. Hochevar also drew 10 ground balls against 10 balls in the air, right in line with his 49.6% ground ball rate. 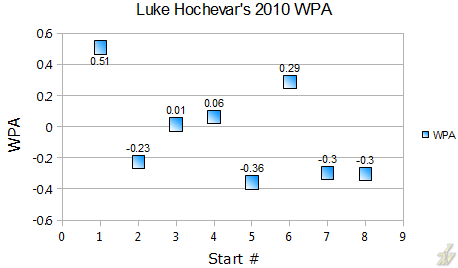 The most encouraging sign for Hochevar in today’s start was a 15.9% swinging strike rate. That’s over double both his career rate of 7.9% and his season-to-date rate of 7.7%. Hochevar was drawing swinging strikes on nearly every one of the seven pitches the Pitch F/X data recorded today. Particularly effective were his cut fastball and slider – Hochevar threw the two pitches a combined 33 times, drawing 24 strikes (72.7%) and 5 swinging strikes (15.2%). His fastball was around the zone all day. Only 11 of the 40 fastballs that he threw missed the rulebook strike zone, and he also drew 2 swinging strikes on it. Overall 29 of his fastballs were strikes, for a 70.7% rate. With the fastball averaging 93.6 MPH and topping out at 95.5, it should be a huge weapon for Hochevar, especially if he locates his secondary pitches as he was today. According to pitch type linear weights, the fastball was Hochevar’s most effective pitch, at -1.97 runs in only 40 pitches – a rate of -4.95 runs per 100 pitches thrown, an incredible rate for a fastball. The Royals won’t be contending this year, as they’re already 8 games behind the Twins for the division and 9 games behind the Yankees for the Wild Card. With Zack Greinke already in place, the team sorely needs a second pitcher to step into that rotation. The Royals hope that Hochevar can be that guy, and today was an indication of just what he can do. We hoped you liked reading Hochevar’s Complete Game by Jack Moore! The games with the higher velocity are his 3 home starts so far, so I’m guessing there’s an issue with the pitch f/x at Kauffman. And by today, I mean yesterday. Yes the gun at Kauffman is about 1.5 to 2 MPH fast.